The recovery of old firearm, ammunition, grenade, mortar etc concealed under soil/water-body is often reported. The examination of such cases by investigating agency/ballistics expert necessitates to establish various facts on them since use of such material by shooter for firing involves risk due to improper storage. 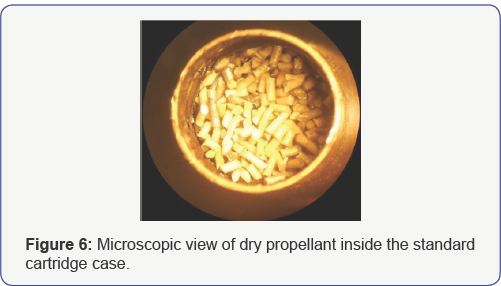 The non availability of dry and cool condition and dumping under variable temperature, extreme humid condition may change the ductibility of the cartridge material, composition of the primer/propellant charges. Further, the body of such material made of different metals may get corroded/oxidized and may split/rupture when fired. The examination of such old ammunition requires to know the possible physical/chemical changes when kept under unstable environment for long years. In one case some old 9 mm ammunition were unearthed by labourers when digging soil and the investigating agency sent the recovered ammunition to the forensic science laboratory to know their condition. In order to ascertain various parameters, different examinations like indoor test firing of the ammunition, combustible character of propellant charges, elemental composition of charges by chemical analysis have been conducted. The generated data would help the shooter to take precautionary measure and ballistics expert to know the chemistry of old dumped ammunition. Head stamp to know the year of manufacture, countryof origin etc. A study was made on the examination of old ammunition by Pal et al. . This paper deals with the detailed examination procedure of dumped ammunition concealed under soil. 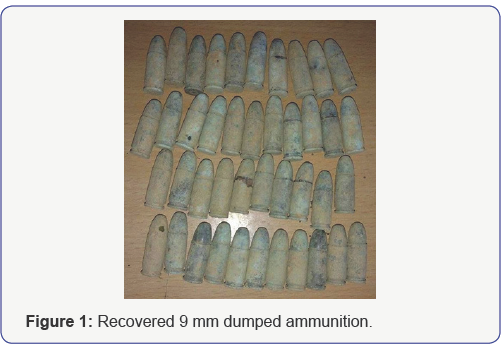 The recovered 9 mm pistol cartridges along with head stamp of one representative cartridge were photographed and shown in the Figures 1 & 2 respectively. The cartridges were soiled and oxidized. Out of the bulk four cartridges were randomly selected and initially cleaned by acetone followed with dilute hydrochloric acid to decipher the head stamp impressions. The parameters such as caliber, length, diameter of base, body, neck and weight of each cartridge were recorded and shown in Table 1. An electronic vernier caliper (Mitutoyo, Japan) was used to measure the caliber, length, and diameter. 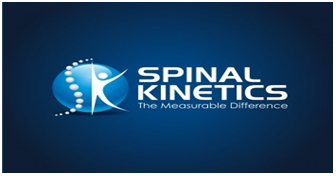 Weight of the cartridges was obtained with a compact digital balance (National weighing and Instruments Company, Australia, Model FEJ-5000B). 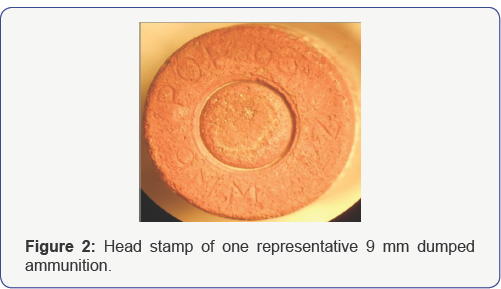 The head stamp of one representative cartridge was recorded under microscope and shown in the Figure 2. 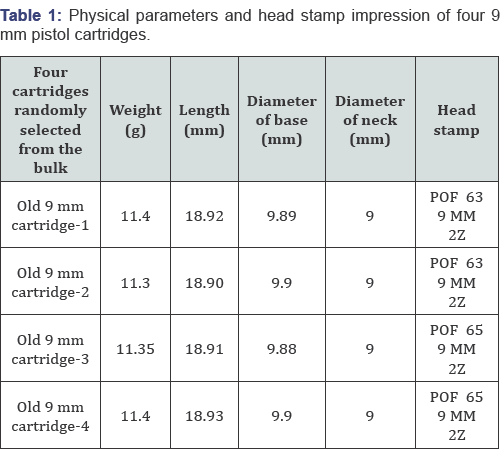 On the basis of factory codes available in the ballistics literature, the head stamp markings were compared and summarized in the Table 1. The results shown in the Table 1 indicate that the cartridges are about 40 to 50-year old. Four cartridges were randomly selected for indoor test firing to know whether they are live or not. But the test firing was not successful, even using five similar firearms, suggesting the cartridges were outlived. The ineffective result could be due to change in chemical composition of the propellant charge or absorption of moisture by them. To ascertain the possible cause, all the four cartridges were mechanically opened and found the propellant charges swelled/damped. The moisture absorbed by the propellant charge during long storage under soil adversely affected their sensitivity/combustible property. The charges taken from the cartridges failed to burn on ignition. However, after drying under sunlight they burnt, suggesting that the chemical composition was not degraded. The ion chromatogram study of propellant charge has been made. 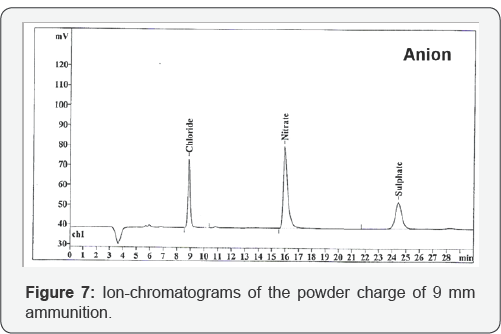 Ion chromatogram of the anion of the propellant charge shown in the Figure 7 indicates the presence of nitrates, chlorides and sulphates ion. 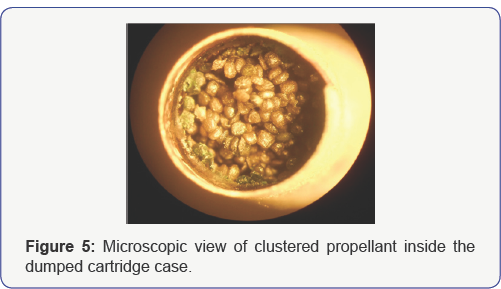 Further, the dried charges have been reassembled inside a standard 9 mm cartridge and test firing has been conducted.Surprisingly the indoor test firing becomes successful indicating the propellants are active though kept under soil for long years. 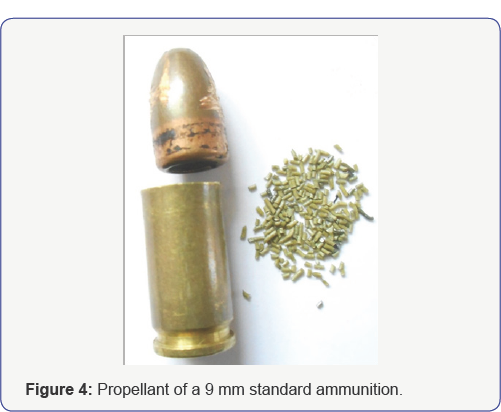 The recovery of dumped ammunition and their forensic examination have provided a lot of information like effectiveness, change in composition of propellant charge and their origin. The generated data and method adopted in the examination will be of great help to the shooter, ballistics expert and investigating agency to solve such cases in future. 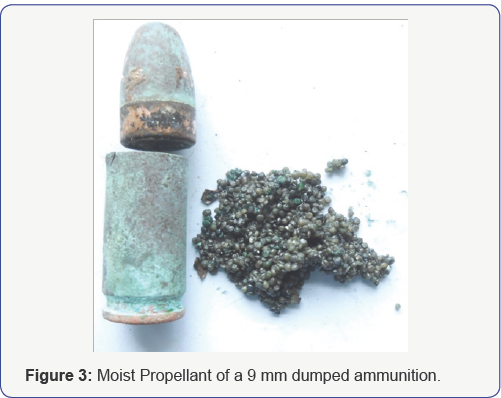 The study concludes that even the ammunition were dumped for about 40 to 50 years, but no change in composition of propellant charges were observed except damp and corrosion on body. IANS (2014) Armed Forces Special Powers Act Extended in Tripura for Six Months. The Economic Times, India. Fr Paul G Documentation Centre (2014) Naxals/Maoists. Indian Social Institute, India. N Rahul (2005) Huge Arms Dump Unearthed. The Hindu, India. Pal A, Pratihari HK (2016) Study on 50 year old unearthed ammunition. AFTE Journal 48(1): 53-55.